After attending the “Spheres of Influence” day school last month, I decided to finally get myself a copy of this fine book. One of the authors, Richard Suggett of the Royal Commission on the Ancient and Historical Monuments of Wales, gave a talk about “Anglesey’s Plastai”, which whetted my appetite for more details on the ancient manor houses of the Island. Co-authored with Margaret Dunn of Discovering Old Welsh Houses and published in 2014, this large format and well illustrated book charts the development of gentry houses in North-west Wales through the late medieval and early modern periods. In particular, it places these developments on a firm timeline by using dendrochronology (dating building timber through the growth rings in the wood) to accurately date the main structural elements. The introduction begins by describing the usual medieval style of house throughout England and Wales, the hall-house. This type of house, built to impress, focused on the large main hall, open to the roof, which was held up by massive curved timber frames called crucks. An open hearth, with no chimney, stood in the middle of the hall, with the smoke rising up to the roof. Portions of the building were partitioned off at either end, with service rooms such as the buttery and pantry at one end, and the owner’s private chamber at the other. In the first half of the 16th century this house plan began to be modified, initially with the building of fireplaces and chimneys. Existing hall-houses replaced the central hearth with a fireplace, while newly built houses began placing the fireplaces at the end of the hall. Since the chimney took the smoke directly outside the house, the need for a vast open space above the hall, where the smoke dissipated, was eliminated. This space was then used to create a second story of private chambers, increasing the living space. All these modifications in the house plan lead to the classic Snowdonia-style house. These are two story dwellings with the distinctive feature of an asymmetrically-placed entranceway, positioned one third of the way along the side wall. This formed a passageway through the house to another door on the other side. On one side would be two service rooms, while on the other was the larger main hall, with a fireplace at the far end. Beside the fireplace was usually a spiral staircase leading up to the chambers on the first floor. The rest of the book describes in detail a number of examples of these ancient houses from around North-west Wales. A brief history of each house is given, along with floor plan diagrams and photographs of key features. This publication being the result of the North-west Wales Dendrochronology Project, the results of the dating of various timbers of the house are also included. A description of the project and the list of the dozens of volunteers involved can be found at the end of the book. Given the title of the book, it is unsurprising that most of the houses are in Snowdonia. However, two Anglesey houses are featured. I was fortunate to have visited one of them back in 2015 on an Anglesey Antiquarian Society field trip. 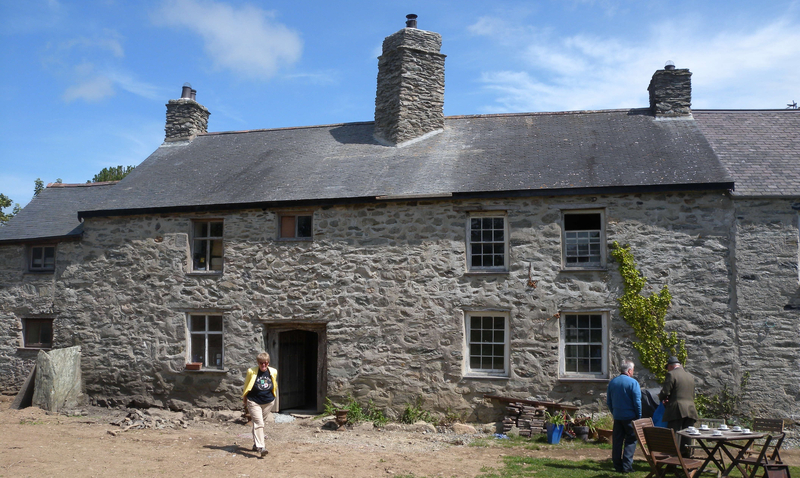 Gronant was first built around 1540 by Robert Bulkeley, grandson of William Bulkeley, the first of the Bulkeleys to have come from Cheshire and settled in Beaumaris. It remained in the Bulkeley family until 1888. The main part of the house follows the classic Snowdonia pattern, with a cross passage between the main hall on one side and a parlour on the other. Around 1618 a second house was built at a right angle to the original house, possibly to house one of the newly married sons of the Bulkeley family. In the 19th century the two houses were linked through an extension (to the right in the photo above). The chamber above the hall in the original building gives us an idea of what it might have looked like at the height of its grandeur. 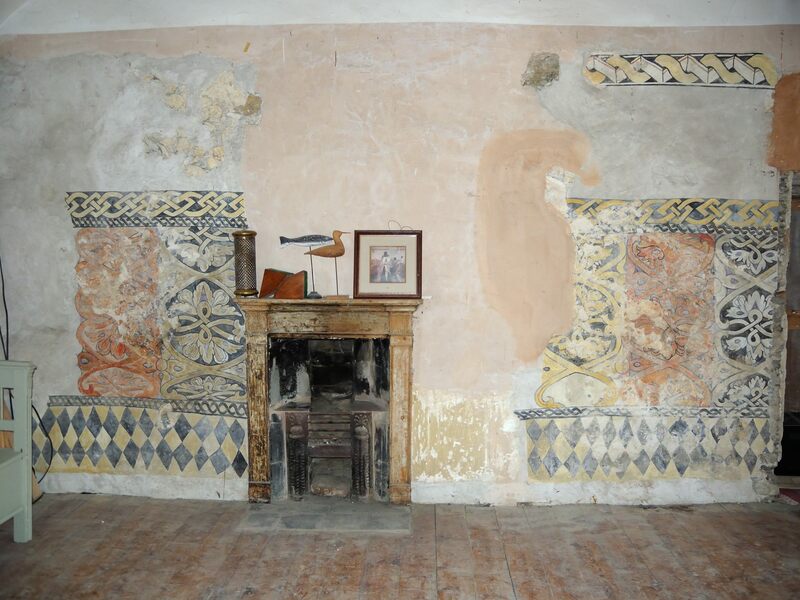 Fragments of wall paintings can be seen, made up of colourful floral and geometric designs. Wall paintings like this would have been very common at the time, but few have survived the elements and centuries of redecoration. If you find yourself fascinated by the history of these ancient houses, how they developed and were modified, then this is an excellent addition to your library. It is available at Amazon.co.uk or through your local bookshop and other retailers. Has anyone investigated Fron Oleau, Carngwch, Llithfaen, Gwynedd? It was once my home. From your description I would say the main part was originally a hall house. A fire place was inserted and there is clear evidence of a cross passage. Not that I know of. It’s not in the book, but that just gives a few examples, not an exhaustive list. I can’t find any mention of it among listed and historic buildings.